Posted May 9th, 2012 by Adam & filed under Codastar News. Falcon Recruitment approached Codastar Design looking for a fresh new image for their Social Media presence , and got exactly that! 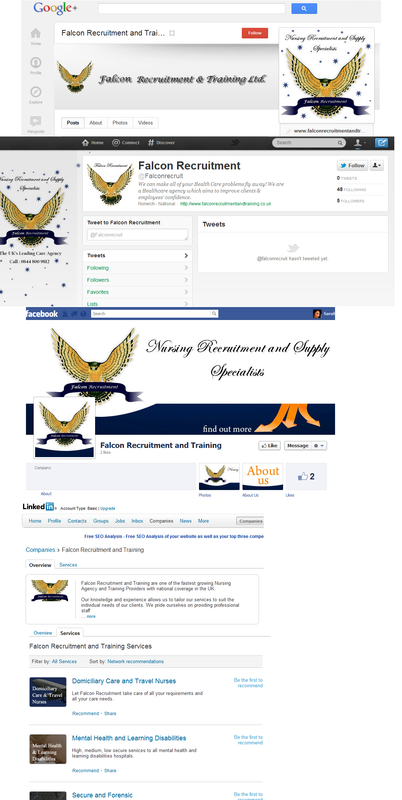 Falcon received the full treatment, with a slick overhaul of their Facebook, Twitter, Linkedin and Google+ pages. The Recruitment industry is one that customer/client engagement is key, and a consistent branding across all platforms is part and parcel of promoting a strong social media strategy. Step one was including company imagery as a striking background image for twitter, and a prominent logo for Google+. For Linkedin, we developed their “services” page, showcasing their strongest skills and services, carefully constructed to maximise ease of use for their users, and presenting their content in a clear and concise fashion to maximise their online reach. With the implementation of Timeline and Tabs, Facebook has progressively become more a “mini website” than a page, making design and development more important than ever. Falcon now have an eye catching cover banner and profile image, and a bespoke “About” Tab, depicting clear calls to action and contact details, with links back to their main site for further information.